« What's the Right Price? DSLR sales up 30% (on unit volume). This is the jewel in the camera division's results (74% of the sales in yen, while only 29% of the units). While some other sub-components (WiFi equipped compacts) also did well, this DSLR sales growth is the meat in the meal. Entry level Canon DSLRs sold quite well in the period, so a well-specified mirrorless camera would eat into that, I think. Canon is predicting strong DSLR sales through the full year (9.2m units, up 27% over 2011). Compact sales predicted to rise 17%. Given the flatness of the compact camera market, the immediate question one has to ask is how do you achieve that kind of growth? The answer came in Tanaka-san's commentary: "To achieve this, we will further differentiate and enhance our lineup by launching new cameras offering the image qualities that approaches SLR cameras." In other words, the G1x was just the first in a salvo of large sensor compacts. So put the two together: strong push in DSLR sales with higher-performance compacts. Where would a mirrorless offering squeeze into that? I've been testing a G1x, and its image quality is as competent as most m4/3 cameras. It's a darned good camera, very versatile, with the primary difference between it and a mirrorless camera coming primarily in the lack of lens flexibility. 28mm f/2.8 equivalent isn't particularly wide nor fast. 110mm f/5.6 isn't particularly long and definitely not fast. But as a convenience camera with high performance, it's hard to top. 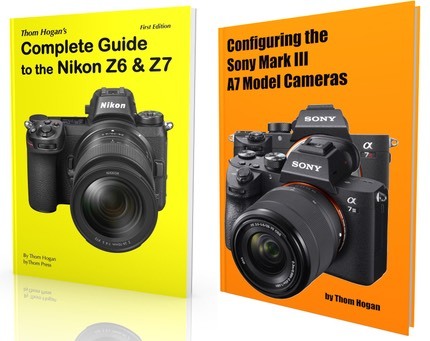 Indeed, look at the T2i and G1x side-by-side: the T2i is an 18mp DLSR for US$700 and the G1x is a 14mp large sensor compact for US$800. How do you fit a mirrorless offering in when you're already got overlap? You'd have to price a mirrorless camera higher than the G1x (or risk losing G1x sales), and at a higher price the DSLRs just look like a better choice (at US$1000 you get the very well specified 60D, for example). Now imagine a different scenario: Canon continues to iterate the low-end DSLRs upward (which would push something like the T2i to the US$600 price point) and the G1x variations downward (which would give you a sub-US$500 large sensor compact). At least for the short term, this seems to be Canon's strategy. In a lot of respects, it makes sense. Note that Nikon has gotten themselves into the rock and a hard place that Canon is currently avoiding: Coolpix P7100 US$500, D3200 DSLR US$700, Nikon V1 US$900! In other words, Nikon's in-between camera (mirrorless) is actually priced above the compact/DSLR changeover (even the low-end J1 comes in at about the D3200 price, though lately Nikon is discounting some versions of that model heavily).